The main point of this simulation is to show that light rays leaving an object travel in straight lines. The simulation has two light bulbs that can be turned on or off independently. The bulbs can be dragged around the screen to change their positions. The light from the bulbs either passes through a mask with a hole in it, or it is blocked by an object, as it travels to a screen on the right of the simulation. Investigate how the patterns of light and shadows change as you move the bulbs, the mask or object, and/or the screen, and as you change the size of the mask or object. Start with the mask and just one of the light sources. This illuminates part of the screen. Let's say you wanted to illuminate a larger part of the screen. Could you do this by moving the light source? If so, do you move the light source toward the screen or away from the screen? Could you, instead, illuminate more of the screen by moving the mask? If so, do you move the mask toward the source or away from the source? Could you, instead, illuminate more of the screen by moving the screen? If so, do you move the screen toward the mask and the source or away from the mask and source? Before you turn on the second source, predict the color that will be produced in a region that is illuminated by both sources simultaneously. Turn on the second source (so both the red source and the blue source emit light), and check your prediction. 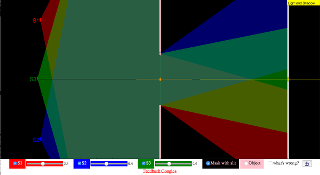 Using two sources and the mask, determine the conditions under which the sources light up distinct (non-overlapping) regions on the screen, and when they light up overlapping regions of the screen. Now use just one source and an object, which casts a shadow on the screen. Let's say you wanted the shadow to cover a larger part of the screen. Could you do this by moving the light source? If so, do you move the light source toward the screen or away from the screen? Could you, instead, produce a larger shadow on the screen by moving the mask? If so, do you move the mask toward the source or away from the source? Could you, instead, produce a larger shadow on the screen by moving the screen? If so, do you move the screen toward the mask and the source or away from the mask and source? How do your answers to activity 1 compare to your answers to activity 4? Explain what the connection is between the two activitoes. Define what is meant by a light source. Give examples of light sources in their everyday lives. Draw the path of light from a light source to our eyes. Recognise that an object can be seen when it reflects light or when it is a source of light. Teacher will guide the pupils through the next part of the experiment. Using the materials given and imagine that the torch is our primary light source, which is the Sun, investigate if the different position of the Sun in the sky at different times of the day have any effect on the shadow formed by an object. What do you notice about the shadow as you move the torch following the path of the Sun? Is the length of the shadow the same throughout the day? Long shadows are cast in the morning and evening when the sun is low in the sky. Shadows are shortest at noon when the sun is directly overhead. Shadows always point in the opposite direction from the sun. Show YouTube videos on shadow puppetry. Begin by investigating and asking the following questions: What is a shadow puppet? How are they put together? How do they move? Where have you seen shadows? Can you make shadows creatures with your own hands?